If you are ready to go beyond the typical dinner party and excite your guests with something out of the box, a portable paint party might be the way to go. I provide everything you need including instruction while you and your guests sit back and enjoy the experience. 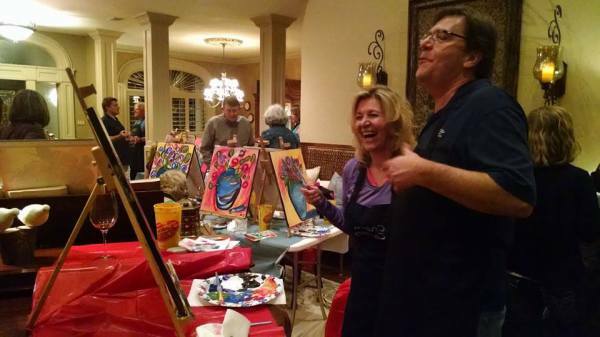 Paint parties aren't just for canvases anymore! Join the exciting trend of personalizing glassware. Yes, we do that as well. Just looking to join in on some fun without actually organizing an event? Look no further than our public paint night schedule. Pay ahead to guarantee seating and save $, or just drop in if you are in the area. Either way, you are welcome to jump right in for a fun evening. Enjoy the painting experience in the comfort of your own home. Cruising Canvases offers exceptional instruction catered to your interest and needs, and does this in the comfort of your own home or venue of choice. Make your event creative and keep it personal. Take a look at the fun others are having with Cruising Canvases.